April 5, 2011  The driver was not hurt. 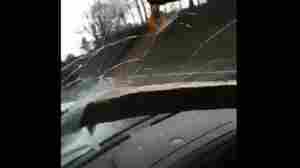 She's lucky, because a piece of lumber came flying into her windshield. And it was all recorded by her camera phone.